Two Fridays ago, I made a drink that I spotted on Eric Witz's tumblr that he created called the Red Right Hook. 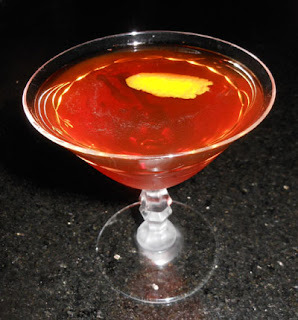 The recipe was a mashup of a Manhattan variation, the Red Hook, and a Rum Negroni, the Right Hand, with a nod to Nick Cave's Red Right Hand song for a name. The only substitution I made was using Smith & Cross in place of the Trinidadian rum he called for; perhaps, I should have reached for a less aggressive rum though. The orange twist's oils brightened the funky rum's aroma. A malt and grape sip led into a swallow that began with a rye and rum combination that seemed like neither base spirit. The swallow ended with a Campari and Maraschino pairing and a chocolate finish. Sounds fantastic, and also - good taste in music. I can hear the bells from that song now. It was (although I wished that I had used a less over the top rum for it drowned out the liqueur notes). Campari and Maraschino liqueur always play well together. Made this with half as much Smith & Cross and it was still the predominant flavor. That stuff is fierce.